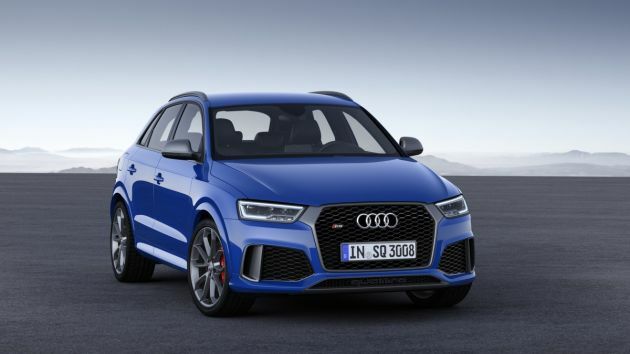 Audi has introduced the newest model joining the RS Performance family, the 2016 Audi RS Q3 Performance. Not does the Audi RS Q3 Performance come with a more powerful engine, but it also gets exclusive exterior and interior features that make it stand out. With all these new features, the RS Q3 Performance has become Audi's most powerful compact SUV. The 2016 Audi RS Q3 Performance is powered by the same 2.5-liter TFSI turbocharged five-cylinder engine as the RS Q3; however, the engine was modified to deliver more power. It now produces 367 horsepower and 343 lb-ft of torque. Power is sent to all wheels via the sporty seven-speed S tronic dual-clutch transmission. The Performance-badged SUV can go from 0 to 62 mph in 4.4 seconds and attain a top speed of 167.8 mph. The chassis has been equipped with the RS sport suspension making the RS Q3 Performance 20 mm lower than the standard RS Q3 model. Audi is also offering RS sport suspension plus with adaptive dampers as an added option. In terms of design, the 2016 Audi RS Q3 Performance is characterized by standard RS design cues like the sporty bumpers, large front air inlets, gloss black honeycomb grille, sculpted rear bumper and the RS exhaust system. However, the performance model gets additional and exclusive features. The air inlet duct, its Quattro logo and its lateral flaps all feature a matte titanium finish. The Audi Singleframe grille, side window strips, roof rails, exterior mirror housings and the 20-inch five twin-spoke wheels also come with the same exclusive finish. Inside, the Audi RS Q3 also features the same dynamic design found on the car's exterior. The SUV comes with RS Q3-badged sports seats in black Alcantara and leather. The cabin also features blue accent stitching found in the RS sport leather steering wheel, center armrest and selector level gaiter. To further enhance the look of the SUV, Audi is offering several design packages. The SUV also comes standard with the parking system plus, the Audi sound system, deluxe automatic air conditioning, MMI radio and LED headlights. The 2016 Audi RS Q3 Performance will make its world premiere at the 2016 Geneva Motor Show this March. Immediately after its debut, the SUV will be available to order in Germany for 61,000 euros ($68,000). The SUV is expected to commence deliveries by the second quarter of 2016. Unfortunately, the 2016 Audi RS Q3 Performance will not be arriving in the U.S.